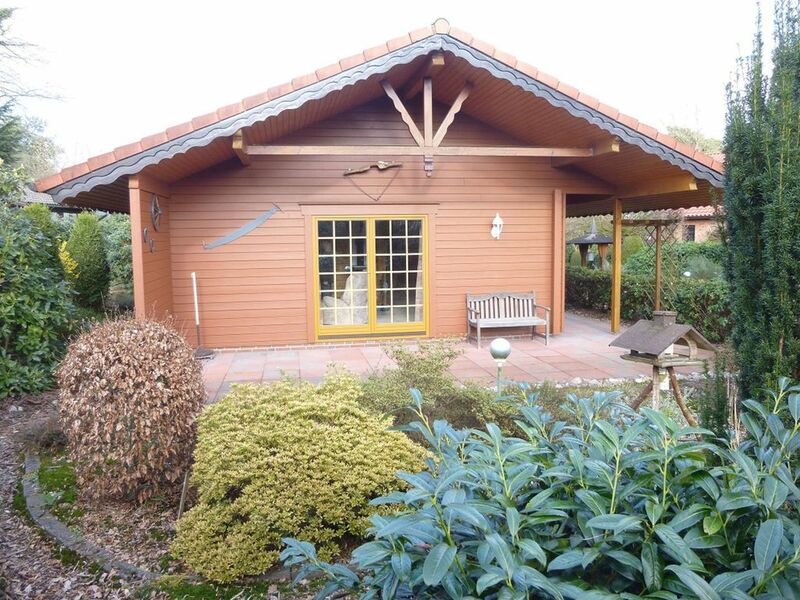 Welcome to our 62 sqm large and lovingly furnished holiday house in the Seepark Lehe in the village Wiefelstede. The wooden house was built in 1996 and will be used for the first time in 2016 with the Jürgens family as a new owner as a holiday home. If you are looking for peace and relaxation, but also not far from the urban life, then you are exactly right here. Our holiday house is situated in quiet surroundings in the Seepark Lehe only 5km from the main town of the village in Wiefelstede. The pedestrian zone of the city Oldenburg is also within 20 minutes by car to reach. Two bedrooms and one children respectively Guest room for one person makes a pleasant rest. The house is further equipped with a living / dining area with direct access to the terrace in the outdoor area. For the winter months, a closed fireplace also provides for soothing warmth. In the entrance area is a modern kitchen. Of course, the house is also equipped with a bathroom with shower and toilet. You can park your car directly at the house under a carport. Bare et superlækkert sted at holde ferie for 2eller 4 personer. En skøn bjælkehytte hvor alt var incl. i prisen også brænde til brændeovnen. Huset ligger i skønne rolige omgivelser nær en sø. Herfra er der nær til masser af natur og store byer. Vi vil meget gerne komme igen på et andet tidspunkt af året. Vi kan kun anbefale huset. ps. Et eneste lille minus var nok at der ikke var nogen vaskemaskine i huset. In Wiefelstede, relaxation and adventure go hand in hand. A wide range of leisure activities and holiday apartments in the picturesque nature of the Lower Saxony ensure a relaxing holiday. As an active vacationer you are in good hands in Wiefelstede. Here you can put your body to the test in unusual sports, such as football golf, SwinGolf or Boßeln. The climbing forest will also do its part as the nearby lake, which invites you to extensive water sports. The park landscapes around Ammerland can best be explored by bike, on horseback or on a simple hike. So there are a total of seven theme routes for cyclists, which lead you once across the Ammerland park landscape. Speaking of parkland: In the town of Wiefelstedt you will find various parks, which invite you to linger and relax. The natural stone garden in Westerholtsfelde or the Rhododendronpark Gristede are just two examples of Ammerland nature. If you have exhausted enough, it is time to give the body and mind a little rest. The Wiefelsteder hosts provide you with a wide range of apartments, holiday homes and other holiday accommodations. If you have found something suitable, you should set out to get to know the Wiefelsteder culture. The Drechslerei Thien, the Heimatmuseum "Haus Wedel" and the historic Aunt Emma store know a lot about the past of the place to report. So the local museum tells the story of the village peasants, while the mom and pop shop still looks like a shop from the early 20th century. Century and has preserved all its traditions. Also worth seeing is the Bokeler castle. The complex of double walled rings dates back to scientific calculations from the year 850 AD, which would make the castle the oldest cultural monument in the Ammerland. For the ultimate relaxation experience, visit the Mother, Father and Child Clinic. In addition to an indoor and leisure pool and sports therapy treatments, the clinic stands out especially through programs that are to give all ages in a playful way self-assurance and promote movement. If you are feeling hungry, you can buy fresh plant and animal products directly from the Ammerland region at the Eytje-Hof in Gristede. In Wiefelstede itself you will be provided with a varied gastronomy. From typical Ammerländischer cuisine to Greek and Italian all tastes are covered. There are many worthwhile destinations around Wiefelstede. Clearly, however, are undoubtedly Bad Zwischenahn and Butjadingen-Burhave. Bad Zwischenahn is only about 20 minutes away from Wiefelstede and is often referred to as the "Pearl of the Ammerland". The location directly on the Zwischenahner Meer calls many water sports on the plan, but also have to abide by the strict environmental protection regulations! Apart from that the resort inspires with its Moorheilbad, its various leisure activities as well as the local curiosities like the Ammerländer Zinnlöffel or the Kohlfahrten. The place Burhave is located on the peninsula Butjadingen, a good three quarters of an hour north of Wiefelstede. The popular bath on the North Sea impresses with its many beaches, including a separate dog beach, an extensive spa offer and the leisure center North Sea Lagoon Butjadingen. A highlight of Northern Germany is the Hanseatic city of Bremen. Famous for its Bremen Town Musicians, the "City of Science" is a stronghold of Northern German culture whose maritime flair is noticeable on every corner of the city. The 600-year-old town hall and the added Roland are just the tip of the iceberg at attractions that Bremen has to offer.